Pyromaniacs all across the States are gearing up for their favorite day: The 4th of July. Technically, it's an American holiday to celebrate independence from England. But we all know its true popularity stems from great BBQ and dazzling fireworks displays. If you want to capture your own fiery composition, here are a few tips. Let's start with the basics: turn off your flash. Yes, you're going to be shooting in a dark environment, and if your camera is set to auto flash, it's going to fire. This is the last thing you want, so turn it off. Resist the urge to increase your ISO setting. Keep it at 100 to help reduce image noise. You'll also have to switch to manual exposure. Auto exposure will overexpose your dark skies turning them to mushy gray. Start with a manual setting of 3 seconds at F-5.6 or F-8, and see what you get. Adjust accordingly from there. If your camera captures in Raw, you may want to consider it for this event. You'll have an easier time recovering blow-out highlights and controlling the shadow areas of the image. These tips will ensure that you come away from your 4th of July celebration with more than a tummy full of hot dogs and beer. Have a great time! 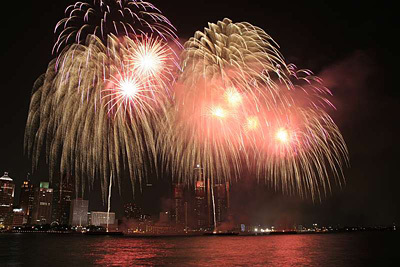 Brian C Davenport went to Windsor,Canada to shoot the Freedom Festival fireworks over the Detroit skyline. Here's how he got the shot. I am not a professional photographer. But i always capturing photos. I like photography and i also want to be a good photographer. thanks for the tips....I will shoot some fireworks pics in my friends wedding.